Luc Nisset, Mary McVey Gill - Spanish in Your Face! Какие слова употребляеются для описания эмоций? Как это говорят по-испански? Шарж иллюстрирует эмоцию или качество человека - фразы на странице помогают найти точный синоним. Is this man calmado or ansioso? Relajado or estresado? You can easily see by the look on his face that he is stressed out: ansioso and estresado. Using the stories that our faces, appearance, and gestures tell, Spanish in Your Face helps you learn and remember essential Spanish vocabulary and everyday expressions relating to personality, attitudes, moods, and emotions. 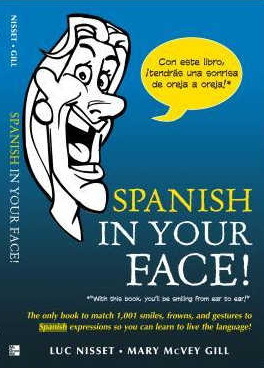 This hugely entertaining book is packed with illustrations that will tickle your funny bone and fine-tune your ability to communicate, face-to-face, in Spanish.